In both the traditional purple Spanish Lavender above and the more uncommon pink, or Kew Red Spanish Lavender on the left, it is easy to see why this plant is sometimes called Rabbit Ears and the bloom is described as a pineapple. The colorful "ears" are actually sterile bracts. The flowers are tiny, dark purple in the traditional Spanish Lavender and dark pink in Kew Red Spanish Lavender. 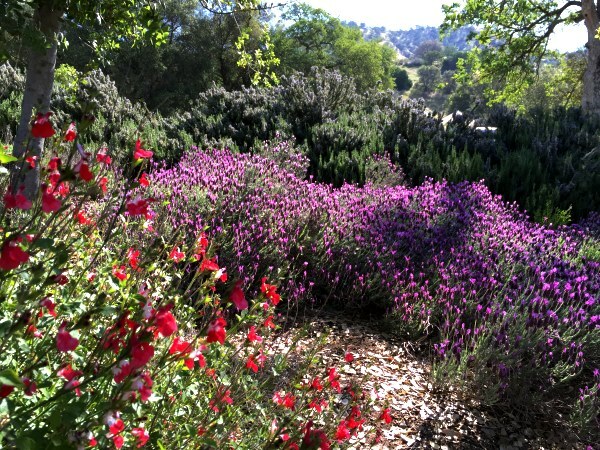 The early spring purple flower heads look great with, and bloom at the same time as Rockroses. Add a few Golden Sage plants for a show-stopping contrast. Loved by bees, Spanish Lavender will make your garden hum with life. 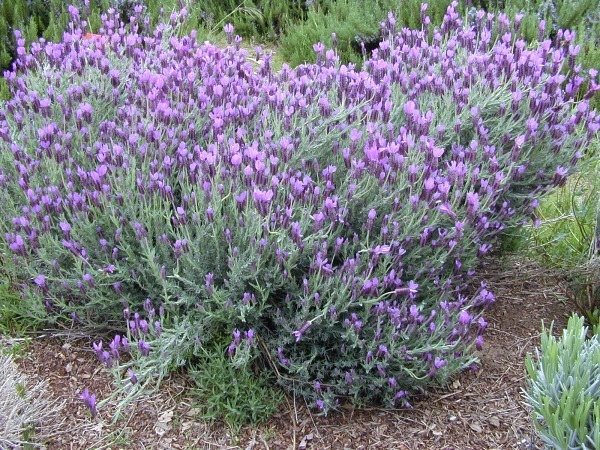 Spanish Lavender blooms profusely in the spring and when it finishes it needs a good pruning. The result will be an attractive, fragrant, gray-green shrub throughout the rest of the year. Native to the Mediterranean region and North Africa, Spanish Lavender seems to be a more suitable lavender choice for those who garden in hot humid climates. The antiseptic, piney fragrance of Spanish Lavender makes it an exceptionally fragrant landscape plant but not the first choice for use in cooking. English Lavenders, both Lavandula angustifolias and Lavandula x intermedias, are preferred in the kitchen. Here the variation of the purple Spanish Lavender called Kew Red Spanish Lavender enjoys the warmth of the rock. While not really red, the flowers tend toward the pink hues with the little "pineapples" showing as more of a maroon than the traditional purple. Planted here in a Mediterranean garden with Orchid Rockrose to the right and Cretan Oregano below front, this young Kew Red Spanish Lavender Plant gets water about once a week in the summer and is in full sun. Of course, watering depends on the location, soil texture and air humidity of each garden. 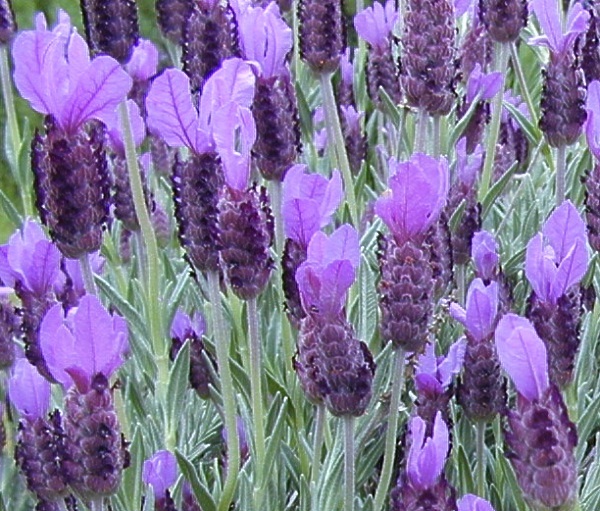 Spanish Lavender is probably what the ancient Greeks and Romans used to scent their bath water. Indeed the word Lavender is from Latin lavare (to wash). Spanish Lavender is often referred to in older publications as French Lavender (which, today, is how we refer to L. dentata). This beautiful ribbon of 20 year old Spanish Lavender is fronted by blooming Hot Lips Salvia and framed by a Rosemary hedge in the back. 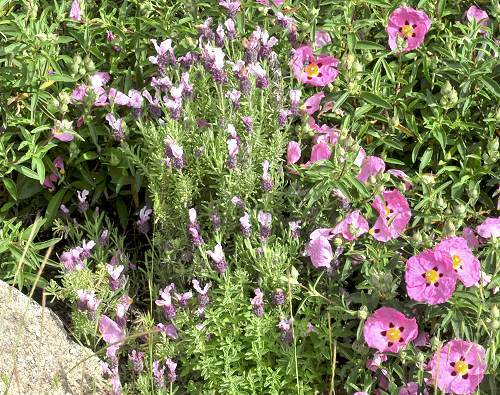 Spanish Lavenders make a great addition to our Zone 8 Fragrant Herb Garden Six Pack. This plant is often available in plug trays. These trays hold 128 of all the same plant. They are a great low cost way to fill a lot of space. Each cell is 3/4 of inch by an inch. Check here to see if Spanish Lavender Plug Trays are available.